bl.uk > Online Gallery Home	> Online exhibitions	> Asia, Pacific and Africa Collections	> Church Gate Street, Bombay. 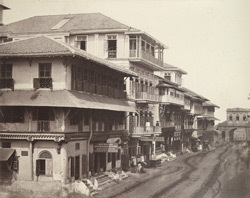 This view of Churchgate Street, now known as Vir Nariman Road, in the Fort area of Bombay was taken in the 1860s to form part of an album entitled 'Photographs of India and Overland Route'. Churchgate Street runs from Horniman Circle at the east end to what was originally named Marine Drive at the edge of the Back Bay. Churchgate Station, the old General Post Office (now the Telegraph Office) and the Cathedral Church of St Thomas, the oldest still-functioning structure in the city, are all located along its length. However, Churchgate Station and the Post Office were later additions to the street and would not have been in existence at the time of this photograph.